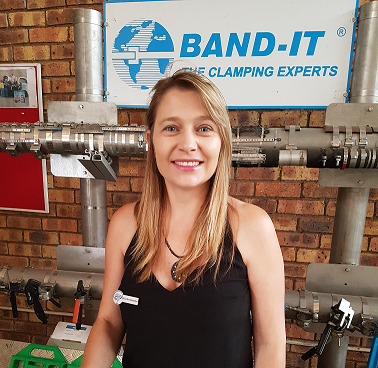 Banding & Identification (ID) Solutions Africa, exclusive local distributor for Band-It, has appointed Rosa Dos Remendos as Sales Director, with effect from October 2017. The announcement was made officially after the Band-It UK sales conference, where Dos Remendos represented the African operation. This follows her 13-year stint at the company in sales, servicing distributors, in addition to overseeing orders from suppliers Band-It UK and Band-It US. Dos Remendos also oversees local band-and-buckle production in-house. “I am proud to have been working with the Band-It range via sales for over 23 years’ to date,” she comments. “My main passion is sales, and having a close working relationship with all of our customers. Overseeing our sales staff, I ensure that we can service our customers to the best of our ability. Meeting their needs is our main priority. I also ensure that production runs smoothly, and that the team is happy. I have always strived to create a positive and encouraging work environment,” Dos Remendos explains. Career highlights to date include visiting Band-IT UK twice in the last two years in order to share ideas, applications, and marketing suggestions. Dos Remendos has also played a key role in promoting the Ultra-Lok® clamping system as an ideal solution for cable-theft prevention, which is a global problem at present. Banding & Identification (ID) Solutions is the African distributor of USA-based Band-It – a leading manufacturer of a full range of stainless steel band, buckle systems, preformed clamps and cable ties for numerous applications.